A local gun club in Scottsdale, Arizona is hosting an event for they would not be allowed to legally own. Even toddlers are permitted to hold high-powered firearms in the photos. Organizers say the event has so far attracted hundreds of participants. The advertises the event as “a one-of-a-kind opportunity to be photographed next to Santa while against a backdrop of a stunning $80,000 Garwood mini-gun and SGC’s coolest belt fed machine guns including the M60, M249 and M240.” The photos are $5 for club members and $10 for non-members. 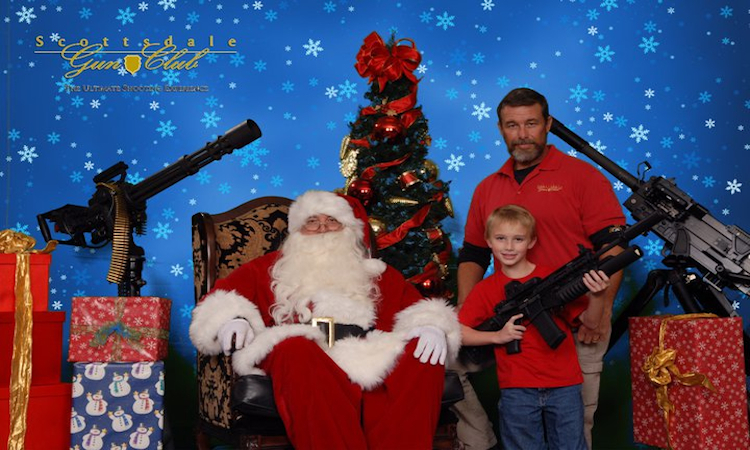 I’ll bet that these kids are going to get EVERYTHING they asked for, considering they told Santa their Christmas list at gunpoint! Enjoy this clip from Bad Santa to get you in the holiday spirit. Totally NSFW or school.